An incredibly well behaved red ink my experience. It’s a nice communist red in a shade I have been looking for. It is just dark enough for casual note taking, but vibrant enough to draw attention. A definite winner! Looking for cheap paper performance? Here it is! The review unit was provided to me for free. The opinions expressed in the review are strictly my own. Thank you to Pen Chalet for providing the review unit, check them out at PenChalet.com. It’s exam season, so it’s only fitting I start with a review on my cheap filler paper from Hilroy as I’ve been going through stacks of them. I was quite impressed with Noodler’s Park Red’s performance. The feathering was extremely minimal, even with thicker nibs like my broad (posing as a fine) nib on my Levenger L-Tech 3.0. Things got really messy with the Ahab flex nib, but actual pools of ink were being laid down, as I’m still trying to get the pen tuned properly after doing an ease my flex mod. The bleedthrough is limited to the flex nib only. The colour is definitely dark enough for casual writing and eye-catching enough for marking or note titles. Let’s start this review with a Japanese EF nib in the form of the Pilot Penmanship. It is a bit light, but almost no feathering. I’m unsure if I would use this ink regularly in such a fine nib. Let’s move up to an F to M nib found on Fountain Pen Revolution’s flex nibs. Some minor featuring if you look very close. Now a Lamy Safari Medium. Actually very close to the FPR flex nib, but a touch drier. Still very minimal feathering. However, #41’s shading is a bit more obvious here. Pardon the poor flex writing. 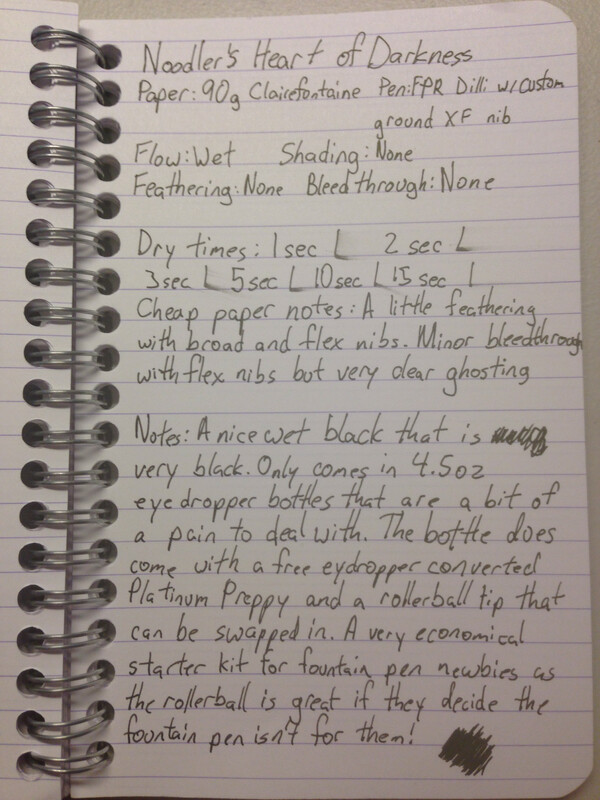 So would I recommend using Noodler’s #41 Brown with cheap paper? Yes! Even with a wet FM nib, there is barely any feathering. Ghosting is bad enough that you won’t use both sides of hte paper, but few inks can pull that off on paper this cheap. The bleedthrough is minimal until I broke out the flex. Please welcome Brandon Postal of the blog Go With Postal as our March guest! Although his blog is only a little over a month old, it’s been buzzing with tons of great posts with lots of coverage on vintage pens. Brandon was kind enough to let me take a peek at his current load out of pens and pencils. A big thanks to Brandon for participating! Be sure to check out his blog at Go With Postal. Welcome to our very first edition of a new monthly segment called Inked Up. Every month, a member of the fountain pen community and I will share our current rotation that has been inked up! Our very first guests are Jon and Liz Chen of Wonder Pens, hailing from Toronto, Canada. Wonder Pens is currently my local store and carries pens, pencils, journals, notebooks, office supplies, tons of fountain pens, and fountain pen accessories. I often plan to visit with the intention of picking up an item or two and end up leaving with a lighter wallet and bag full of ink. If you live in the Greater Toronto Area, be sure to swing by their brick and mortar shop to pet Super the store dog in training while you stock up on ink. Liz gave us a peek at her very colourful rotation. I’m testing out a new camera set up, I think this better reflects the ink’s actual colours. Considering how wet this ink is, it is very surprising that there is barely any feathering and no ghosting. The amazing shading is less pronounced on cheap paper. Apache Sunset is considered a must own for all flex pen and stub nib owners because of its amazing shading properties. It goes from golden yellow to a dark orange. I also noticed this ink seems to get darker in the pen barrel over time. It looks fantastic in a demonstrator! Unfortunately my camera does a poor job capturing how black Noodler’s Heart of Darkness really is. It is the darkest black ink I have encountered so far. A little feathering with broad and flex nibs. Minor Bleedthrough with flex nibs, but very clear ghosting. A nice wet black that is very black. Only comes in 4.5oz eye dropper bottles that are a bit of a pain to deal with. The bottle does come with a free eyedropper converted Platinum Preppy and a rollerball tip that can be swapped in. A very economical starter kit for a fountain pen newbie as the rollerball is great if they decide the fountain pen isn’t for them! Today’s pen check, brought to you by reddit. Kaweco Sport demonstrator with 54th Massachusetts in the cartridge. I try not to dump out the ink that comes in cartridges, but the Kaweco blue ink that came with it was possibly the ugliest blue I laid eyes on. Strangely enough, my last cartridge of Kaweco blue was rather pleasant. Review of pen and ink to come soon!